“He that is impatient, shall suffer damage,” King Solomon says in Proverbs 19:19, and when it comes to investing in income property, he that is patient reaps rewards. While it’s true that now is a pretty good time to make that first investment in rental real estate, it’s always a good time to buy investment property – and hold on to it. Real estate is the asset that keeps on giving. As Jason Hartman points out, every body needs a place to live. And the investor who finds good properties and is willing and able to hold on to them stands to accumulate wealth for the long term. It’s tempting to try to make a quick killing with rapid turnover sales – the so called “flipping” of houses, where an individual buys a somewhat run down house for cheap, makes the necessary repairs and puts the dwelling right back on the market again. That’s a strategy that does make some money; assuming that market conditions allow that the house is sold for more money than the seller put into it. But in order to keep making money, that flipper has to immediately get hold of another property to rehab and resell, with attendant fees and closing costs that whittle away at any potential profits. Once that process stops, so does the money. As Jason points out, that’s not investing. Why not? Investing is a process that yields returns over and above the initial outlay. Buying a rental property and holding on to it allows the investor to generate income from that initial outlay for years to come. Like the speculator, that income property investor has to assume some costs for improvement and maintenance – but that outlay contributes to the long-term return on the initial investment. Although now is a pretty good time to buy real estate, thanks to low interest rates and a gradually improving housing picture. 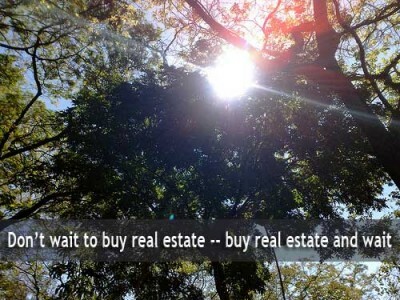 But for the smart investor, there’s never really a bad time to buy real estate. It’s one commodity that never goes out of style. Short Sales: Bad Name for Good Real Estate?